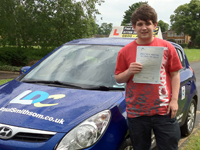 Adam passed his test with 5 minor errors and said "It has been a pleasure to be taught by Paul. 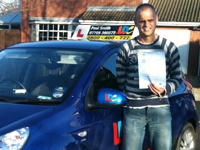 I thoroughly enjoyed every lesson and would recommend Paul to anyone." My experience with Paul Smith has been a hard but fun time. I believe Paul has helped me achieve so much and he is a very good instructor and I wish him all the best in the future. He was always honest about the things you do wrong, but is always kind about it and explains how to do it right. 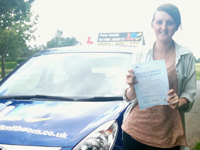 Now I have passed my test I can happily say that I wouldn't have done it without Paul! So very pleased to have passed my driving test. Many thanks for your patient and relaxed manner and for giving me the confidence to pass my test. Thanks for being brilliant and so patient, totally different to my previous instructors!! Had a great time learning to drive with Paul and can highly recommend him. Very calm and builds your confidence quickly. Thanks Paul. 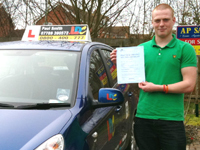 Very happy to have passed my driving test today with Paul Smith LDC. It was really important that I passed as I live out in the middle of no where and needed to be able to drive to get to work. 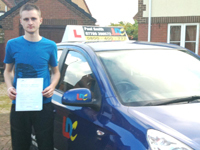 Craig passed his test first time with 2 minors, which was a good thing as his new job depended upon him passing - no pressure! This was a bit of a Smith family effort (none of us are related) - Craig Smith, taught by Paul Smith and examined by Larry Smith! After passing Craig said "Paul is friendly and very easy to get along with. Paul is calm, explained any questions I had well and made me feel comfortable and at ease. 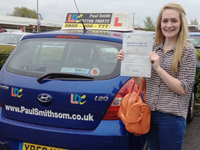 I would definitely recommend Paul Smith LDC to everybody." 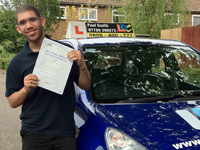 I really enjoyed driving with Paul as he made me feel very comfortable during lessons and I got on with him far better than my previous instructor as his teaching style was far better. 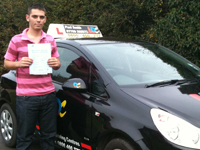 I would definitely recommend Paul to people who are beginning to drive as I passed my test first time with him. 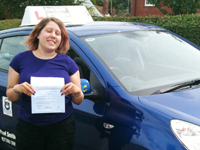 Harjinderpal had only recently arrived in Spalding from Birmingham and soon realised our public transport was not as good as her home towns, so good so decided to learn to drive. 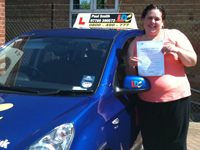 She commented, "Paul has been fantastic in teaching me to drive, answering all my questions and helping my overcome my fears. It has been a pleasure having had Paul teach me. Thank you so much for all your guidance and help, enabling me to pass my test first time with only two minors :)"
Jake passed his test first time with only a couple of minors and had the following to say about his learning to drive experience: "I thought Paul was a very good instructor. He shows you the best and the easiest way to do things. More importantly he is honest about how good you are and what you need to improve upon to do better!" Hi Paul this is Jemma Gaze's mum. I would just like to thank you for the wonderful job you have done in getting Jemma through her driving test first time. She is very happy and I am one very proud mum. Once again, many thanks. 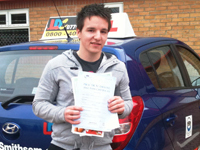 Jon passed his test in Boston first time with 3 minors. 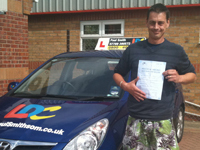 Jon stated - "Paul provided excellent tuition which was aided by the excellent LDC Workbook and DVD resources. Paul was an absolute joy to learn with and great value for money. I would definitely recommend Paul!" I had a great time learning to drive with Paul. 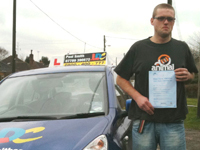 Paul taught both my brother and his girlfriend before me and both passed first time so he came highly recommended. I did the same Semi-Intensive course and found the LDC workbook and DVD training aids complimented Paul's relaxed and patient teaching style. I am from Iran with no good English. 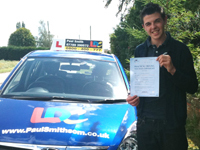 I pass test first time with Paul help and only 4 minor problems. I very happy. Many thankyous Paul, very good teacher. Dear Paul, Thank you so much for all your time and help getting me through my test. I have been having lessons for many years and found your system the most helpful. The home work book and DVDs helped me remember all the things we did during lessons and increased my confidence. I will be recommending you to others and hope to put my two sons in your hands soon, as I feel you will give them the best chance. Thank you once again for a most enjoyable and constructive experience. Paul was a great driving instructor. Even when my test got cancelled he went out of his way to find a new date and I ended up doing my test 40 miles away in Lincoln. I don't think many instructors would be willing to travel to a test that far away. Thanks to Paul's patient and coherent approach I passed on my first attempt. Thank you for getting me through my driving test Paul, it is such a relief. Now I can drive myself to work instead of relying on lifts!! 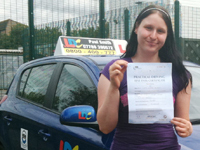 Lyndsey passed her test first time and said, "I wanted to thank you for everything you did for me, your support and encouragement really helped me. I felt so at ease having lessons with Paul. He is always calm, even when you make big mistakes and he makes you feel calm and relaxed from the very first lesson. I would recommend him to anyone." 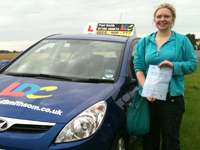 Thank you ever so much for being a fantastic driving instructor! Not only that, but a friend to chat and gossip with on a Friday afternoon! I'm looking forward to many years of motoring and my new found freedom. Thank you once again. It has been a pleasure over the last 3 to 4 months to learn with you Paul. Will be in touch about Pass Plus! Would just like to thank you once again for the skills that you have taught me and the fact that I have picked up so much new knowledge. As for the service, it is without doubt very friendly, informative, but at the same time informal. For the whole time I felt relaxed and comfortable with what I was doing which added to my confidence. I had 100% fun at the same time as 100% learning, which can only bring with it the best results possible - and it did passing first time! 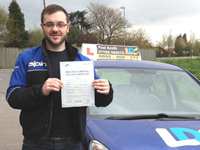 I live in High Wycombe and having had a few previous instructors, none of whom managed to get me through my driving test, I was advised by a relative in Lincolnshire to go with Paul. Even though it was a long way from home I decided to stay with my relative and do an intensive course with Paul. 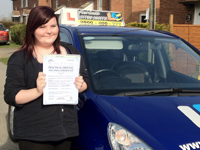 A great choice it was too - I passed my test with 1 minor. Thanks Paul. 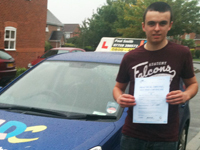 Rob passed his test with 5 minors and said "I thought Paul's teaching fantastic, being well thought out and taught. I would recommend Paul to all!" Today I finally passed my driving test thanks to the patience and skill of Paul. I have had previous instructors who were not in the same league as Paul. I really didn't enjoy learning to drive with my previous instructors, but Paul's calm and structured way of teaching finally made me realise that learning to drive could actually be fun instead of being a chore. I would highly recommend Paul to everyone if you are looking to learn to drive. 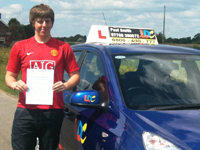 Steve was not the most confident of learners but passed his test with 7 minors. 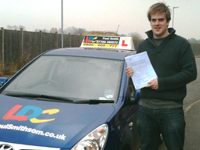 "I thought Paul's instruction was very patient and he boosted my confidence lesson by lesson and never lost faith in my ability to pass the test. Thanks!! After previously being instructed by a different company a while ago, I have found the difference that Paul has made to me learning to drive huge. 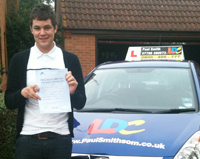 Paul is clear, concise, builds confidence in your own abilities and teaches you to drive - not just how to pass the test! You really do understand what you are doing and why! Paul was a great instructor who is very easy to get along with and I would definitely recommend him to anybody looking to learn to drive. 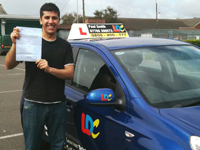 The LDC workbook and DVDs also helped me pass my test first time and complimented Paul's relaxed and structured teaching technique. 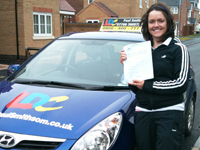 Tracy passed first time getting 7 minors. As Tracy had recently started a new job in Peterborough she wanted to pass quickly to avoid using public transport. 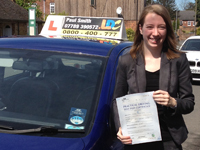 Having passed she wanted to say "I have just completed a 20 hour Intensive Course and passed my test first time! Phew :) Big thanks go to my instructor Paul for his patience and commitment to my learning. 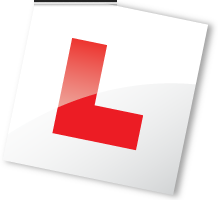 I would highly advise this course with Paul to anyone with some previous driving experience and who wants an easy going instructor to work with. Thanks again Paul.